All homeowners will require gutter services at one time or the other. Your house may be in trouble if you have poorly installed gutters. For instance, during the rainy seasons, water is typically brought to your house, and this may lead to damage to exterior windows and doors, as well as other wood. In the end, this will result in massive damage and expensive maintenance work. It is also common for water to damage the foundation and landscaping. Besides, clogged gutters and drains are a danger to your building. Typically, a blocked gutter passage will send water to an area where it is not needed. A dirty gutter is indeed worse than a no gutter at all. If you are unsure of the state and quality of your gutters, please seek assistance from Midland Gutter Pros. Our company has offered proficient gutter services to residents of Midland, Michigan for the last decade. Our proficient team of professionals focuses on gutter installation, gutter cleaning, as well as gutter repair. For several years now, Midland Gutter Pros has served people of Michigan with professionalism and pride. Our able clients rely on us to fix and maintain their gutter systems. We boast reliability, promptness and expert craft. The essence of repairing and maintaining gutters cannot be overstated. While it is vital to call a team of experts to help you with these services, some users may be the type that loves do-it-yourself tasks. When this is the case, it is essential to have the appropriate tools in places such as work gloves, a putty blade, and ladder. Then, one can utilize an excellent hose to assess the gutters after they have been cleaned out thoroughly. It is advisable to note the areas of the gutter that are regularly prone to clogging to make it easier for one to plot the right path. As a precaution, one should never use the gutters to support the weight or even hang anything from the gutters. Our firm will come to your resident to examine, replace or repair broken exterior or malfunctioning gutters. The typical problems that may need repairs as indicated above are dented, sagging, rust and corrosion, clogging, and leaks or holes. However, this price will be affected by several factors. We at Midland Gutter Pros base our pricing on the linear foot of gutter as well as the downspout material to be replaced or worked on. The condition alongside the kind of existing gutters will play a big part in determining the ultimate price. Additionally, seamless gutters are a vital type to have in any house, but they even at times require replacing or repairing. It is not challenging to repair the issues or leaks with seamless gutters if the appropriate basic steps are taken. With seamless gutters, you need to check out for the holes and downspouts. If the water is not flowing correctly on the downspouts, you may need a repair. 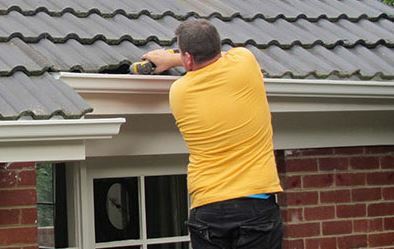 Nonetheless, you should not worry because our company offers seamless gutter repair services.